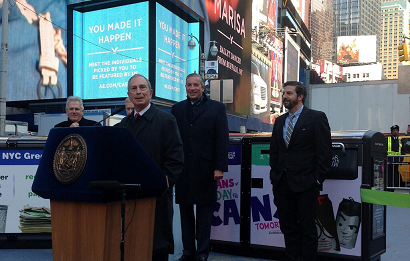 Mayor Michael R. Bloomberg and the Times Square Alliance, in partnership with BigBelly Solar and Alcoa Foundation, today announced the debut of the largest public space recycling initiative in New York City. The pilot, which will bring 30 new BigBelly solar-powered waste and recycling stations to Times Square, will encourage public space recycling among the more than 500,000 daily visitors to the crossroads of the world. Times Square generates approximately 15,300 pounds or 900 bags of garbage a day – more than any other New York City neighborhood. Alcoa Foundation granted Times Square Alliance $250,000 to purchase the 30 Big Belly units that will be placed throughout Times Square. The Mayor was joined at the announcement in Times Square by Sanitation Commissioner John J. Doherty, Alcoa Chairman and CEO Klaus Kleinfeld, Times Square Alliance President Tim Tompkins and BigBelly CEO Jim Norrod. The high-tech stations will channel solar energy to cut greenhouse emissions by 80 percent and hold five times the capacity of traditional sidewalk trash receptacles, significantly reducing the number of trash bags on Times Square streets. The City will launch the program by installing 30 of the high-tech stations in Times Square along Seventh Avenue and Broadway between 42nd and 47th Streets. The stations, which can be remotely monitored to enable staff to only send out collection personnel when they are full, will replace 53 trash bins in the area. The plan calls for additional solar stations to be installed throughout Times Square. Big Belly units have 3 sections: Cans & Bottles; Garbage; Paper. They use solar energy to compact trash are more sanitary that the current bins and require fewer pickups.Last month, in the State of the City speech, Mayor Bloomberg renewed the Administration’s commitment to doubling the city’s recycling rate to 30 percent by 2017. By year’s end, the City will have put 1,000 new recycling containers on streets in all five boroughs. The public space recycling program was launched in April 2007 as part of the City’s comprehensive 20-year Solid Waste Management Plan. The first bins were placed in major commercial strips, in parks and at large transportation hubs, like the Staten Island Ferry terminals. As part of the program, large blue recycling bins collect metal, glass and plastic containers and green bins accept newspapers, and other paper products that previously had been deposited into the City’s 25,000 street corner litter baskets. The Times Square Alliance works to improve and promote Times Square – cultivating the creativity, energy and edge that have made the area an icon of entertainment, culture and urban life for over a century. Founded in 1992, the Alliance keeps the neighborhood clean and safe, promotes local businesses, manages area improvements and produces major annual events with partners, including New Year’s Eve, Solstice in Times Square and Taste of Times Square. As the custodians of Times Square, the Alliance works every day to improve the quality of life for the neighborhood residents and businesses while driving economic growth in New York City. Recognized as a C40 Cities Climate Leadership Group best practice and winner at the 2012 Smart City Expo Awards, BigBelly Solar is a leading global provider of innovative and sustainable solutions for the management of waste & recycling, with more than 1,000 customers worldwide. Alcoa Foundation is one of the largest corporate foundations in the U.S., with assets of approximately US$460 million. Founded 60 years ago, Alcoa Foundation has invested more than US$570 million since 1952. In 2012, Alcoa Foundation contributed more than US$21 million to nonprofit organizations throughout the world, building innovative partnerships to improve the environment and educate tomorrow’s leaders for careers in manufacturing and engineering. The work of Alcoa Foundation is further enhanced by Alcoa’s thousands of employee volunteers who share their talents and time to make a difference in the communities where Alcoa operates. Through the Company’s signature Month of Service program, in 2012, a record 60 percent of Alcoa employees took part in more than 1,050 events across 24 countries, benefiting more than 450,000 people and 2,050 nonprofit organizations. For more information, visit alcoafoundation.com and follow @AlcoaFoundation on Twitter.